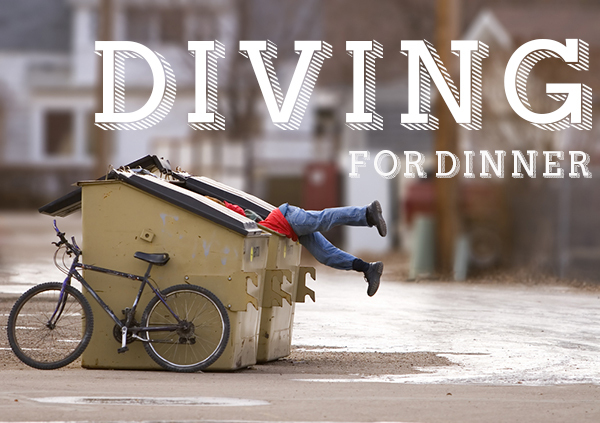 Why would the owner of a marketing company be dumpster diving for food? You could find Rob Greenfield behind your local grocery with his bike propped against the dumpster while he looks for food. He has now completed two rides across America eating primarily from dumpsters. This isn’t a case of extreme cheapskates; Rob’s goal with these rides is to draw attention to how much food is wasted in America. We throw away 165 billion dollars worth of food per year in America. That’s more than the budgets for America’s national parks, public libraries, federal prisons, veteran’s health care, the FBI, and the FDA combined. About 50 million of our 317 million Americans are food insecure yet we produce enough food to feed over 500 million Americans. Just to create just the amount of food that ends up in the landfills we waste enough water to meet the domestic water needs of every American citizen. Most Americans Clean Their Plates. Most Americans are Obese. There is a Connection. 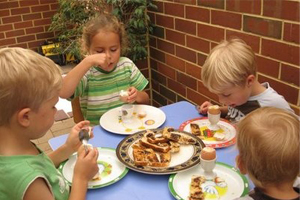 No matter how you phrase it, most of us are taught from a young age to eat everything that is placed before us. While wasting food is never a good idea, there are plenty of ways to prevent waste that don’t include stuffing ourselves with every last morsel of food. However, if you’re part of the clean-your-plate crew, you’re not alone. The average adult eats 92 percent of the food on their plate, Shape Magazine reports, no matter what that food may be. Eating everything on your plate, healthy or no, could be causing you to overeat without you noticing. In turn, that could cause unwanted weight gain. At any rate, science has recently solidified the use of this word: A new study shows that being hangry is a real thing, or at least proves that being hungry definitely affects a person’s mood. 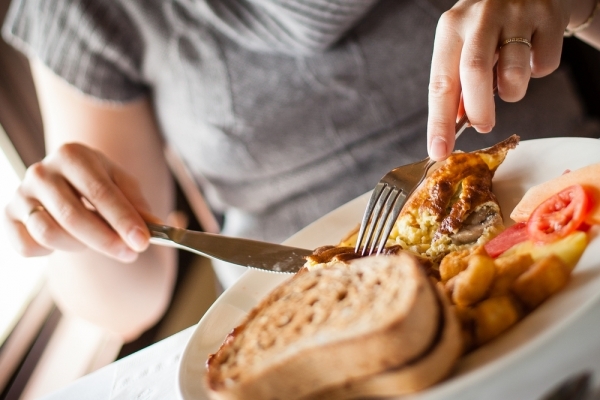 Hungry or Bored: Is Your Eating Emotional or Essential? 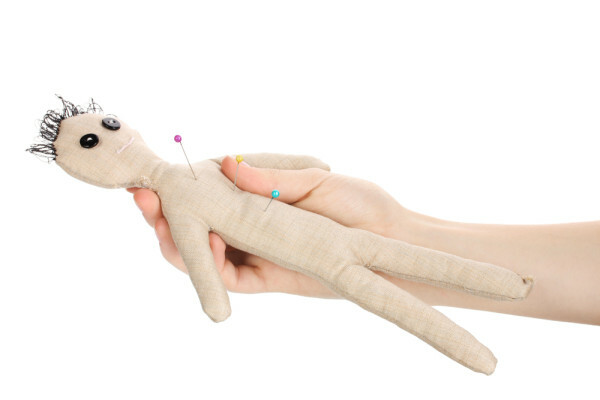 1. a feeling of discomfort or weakness caused by lack of food, coupled with the desire to eat. Those are the dictionary definitions of hunger. But what does hunger really mean? If you break hunger down to the most basic definition, what is it? We’ve determined hunger is the contraction and churning of an empty stomach. Now when was the last time your stomach was truly empty? Claims vary on just how long a healthy, well-nourished person can survive without food; usually it’s somewhere in the area of three to ten weeks. However, the feeling of hunger usually happens after just a few hours of not eating. Have you ever thought to yourself, “Why can’t I lose weight and keep it off?” Today, we are going to talk through the five biggest diet hurdles that many people face and the simple tips to overcome them. Watch our G+ Hangout with Stefanie Painter, RD from Retrofit who explains more. With food in our sights while walking down the street, in our office break room, or next to the cash register at the store, we are prompted to want to eat at any turn. Also, many times we will use food for comfort after having a stressful, long, or emotional day. However, our bodies do not know that we got yelled at by our boss, had back to back meetings, or broke up with our boyfriend. So, eating outside of hunger sabotages our efforts. When we have ignored what true hunger feels like for a long time, we have to retrain our bodies (and brains) to understand when and how much we actually should be eating for a healthy weight. Think of a hunger gauge like a gas tank: On empty, we are the most hungry we have ever felt in our entire lives, like when you have had to fast for a medical test. At full, we are so stuffed that we can’t imagine eating another bite, like on Thanksgiving. These are the extremes that we need to avoid as much as possible. When you are feeling hunger (belly rumbling), then you are at one-quarter of a tank and it’s time to have a meal or snack. As you are eating, slow down and savor each bite so you can feel when you hit half of a tank. This is when hunger is gone. Four to five bites later, you will hit three-quarters of a tank and it’s time to be finished, no matter how much food is left on your plate. Most diets require us to take something out of our food choices or make certain foods “off limits.” While this will create a calorie deficit and result in weight loss, it is not realistic for a long term lifestyle, especially because we are often forced to stop eating some of our favorite foods. Deprivation can quickly lead to disaster! Make ALL foods part of our healthy eating plan! 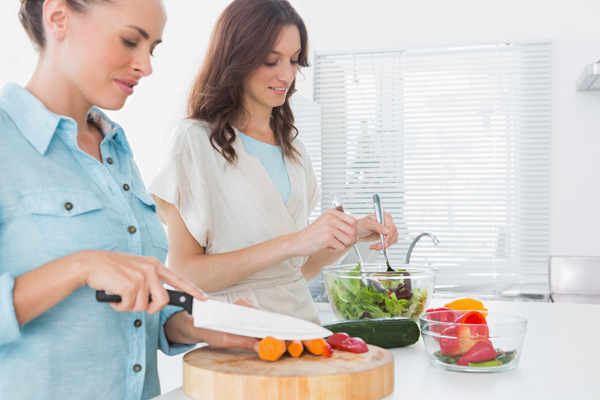 Yes, focus on the healthiest foods — fruits, vegetables, lean proteins, dairy products, and whole grains, as your main choices — but plan for treats and heavier meals in your day or week. For example, if you love chocolate, have one small piece (of dark) every day so you do not feel deprived. If your favorite meal is a burger and fries, make that part of your weekly plan so you can enjoy it. No food is “bad” when we plan for it! Fruits and vegetables are truly powerful foods. They are super nutritious, low calories, and crazy high in fiber. When we work on adding more produce into our life, we can fill up on lower-calorie, high-fiber foods and decrease our portions of higher-calorie foods. Plus, fiber is much harder for the body to break down, so our metabolism goes in to over drive to digest and use produce for fuel. This helps boost our metabolism and burn more fat. Getting in more produce can be a challenge, especially when we aren’t used to eating it often. Start small… add a piece of fruit with breakfast, then some veggies at lunch and dinner, and lastly work on using fruits and vegetables as part of a snack. The ultimate goal is to have 50 percent produce at all of your meals and snacks. Portion distortion is running rampant. Everywhere we go, bigger is better, but not so much for our waistlines. As mentioned before, one of the best ways to start to decrease portions of higher-calorie foods is to aim to make half of your meal or plate produce. Another handy tip is to use your hands as a portion size guide. Put both of your hands out in front of you flat, fingers closed, thumbs tucked in, and touching. This is the appropriate portion of a meal for your body. Most restaurant meals, or even meals that we cook at home, are much larger than this. 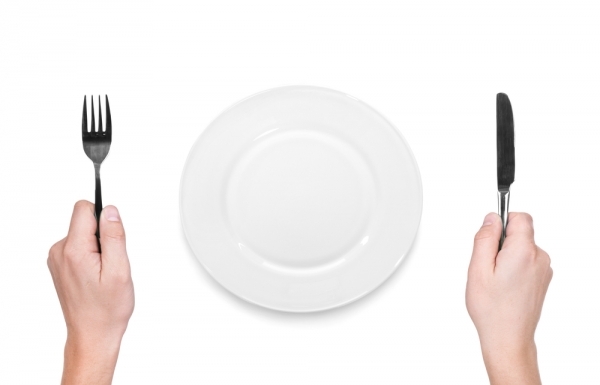 Pairing your hands as a portion size guide with listening to your hunger/fullness queues using the Hunger Gauge is a dynamic combo to keeping your portion sizes in check. Planning ahead can seem daunting, but it doesn’t have to be. It’s not so much about planning, but more about being prepared for whatever your specific challenge may be. If you are going to a restaurant, check the menu and nutrition info online first so you don’t have to make a choice while you are tempted by the dozens of menu items. Headed to a party? Have a snack before you go,so you are not as hungry, and give yourself a drink and/or food limit, such as, one plate of food and two glasses of wine. If you struggle with nighttime snacking, think about what your nighttime snack is going to be as you are preparing dinner. Put together your nighttime snack then, too. Set an alarm on your phone so you know when and what you will be enjoying as your late treat. Thinking about diet hurdles you have faced in the past, how can some of these tips help you stay on track in the future? Imagine sitting at your computer telling a program what you want to eat and how many calories you want your meal to have, then hitting print and feasting on a pizza from your 3D printer. It’s not one of Willy Wonka’s prototypes, but a legitimate concept being developed by mechanical engineer Anjan Contractor and NASA. 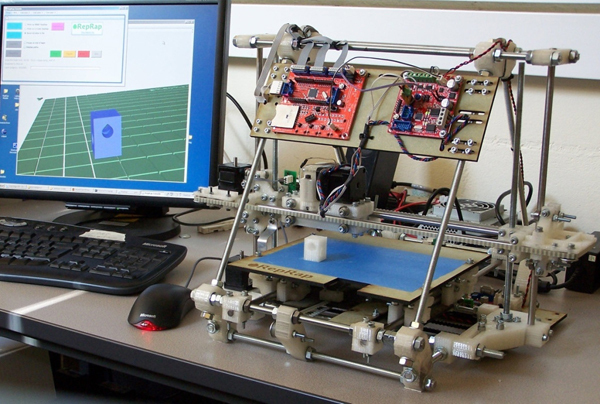 Contractor’s company, Systems & Materials Research Corporation, was recently awarded a six-month, $125,000 grant to develop the sci-fi printer, which could help eliminate food waste and worldwide hunger. The new technology could also help provide a sustainable food source for lengthy space missions, as the printer’s ingredients will have a shelf life of up to 30 years. It works by synthesizing a meal one layer at a time, using proteins, carbohydrates, oils, water, and powdered foodstuff. 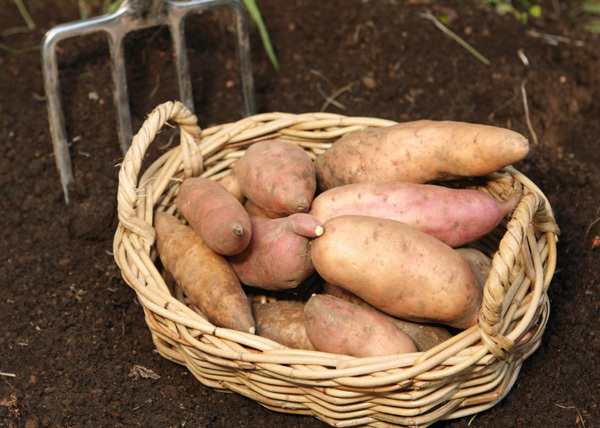 Sweet Potatoes Are Saving Lives – Will You Help? It’s something that mothers around the globe face for their children. We tend to immediately think of poor, underdeveloped countries – those scenes are stark and real and very much deserving of our efforts. It’s very much a domestic issue, too, but one we think isn’t possible right here in our own neighborhoods. According to CharitySub.org, which made hunger its charitable focus last winter, one in seven American homes is considered food insecure, with one in four children living in food insecure homes. The National Letter Carrier Food Drive is the largest single-day food drive in the U.S., and it’s taking place on doorsteps across the country this Saturday, May 12. This marks the food drive’s 20th anniversary of helping millions of American families in need with the help of thousands of local letter carriers. 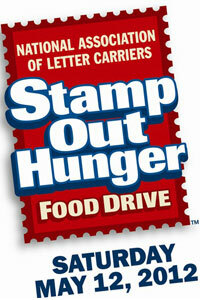 The National Association of Letter Carrier’s Stamp Out Hunger President, Fredrick Rolando, says the need in 2019 is particularly staggering. 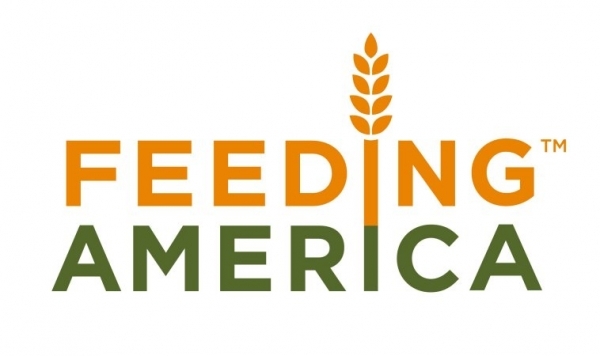 “Sixteen percent of all Americans are at risk of hunger – uncertain where their next meal may be coming from. That includes 1 in 5 children under the age of 18, plus 4 million seniors who are forced everyday to choose between paying a utility bill and buying food,” he said. When I was younger and living in New Mexico with my parents and older sister, we were by no means a rich family. Of the many things I don’t remember about my time there as a 3-8 year old, one thing I do have a vivid memory of is walking down to a nearby park with my mom and sister to get a free lunch that was provided to families in the neighborhood who were going through particularly difficult financial times. We weren’t starving, but the lunch certainly helped. And while some view programs like this is a handout, that isn’t always the case as they can be a great benefit to communities. Although not everyone agrees, this seems to be the case with a recent trend in schools helping out struggling families by feeding children an extra meal before sending them home for the day. On Sunday, October 9th, you and your family can watch a Sesame Street one-hour primetime special on PBC titled Growing Hope Against Hunger with country singer Brad Paisley and a brand new Muppet named Lily. Lily was designed to be as human as possible, in both appearance and mannerisms, to represent the more than 16 million children in the United States that are “food insecure,” a term used to describe those who have limited or uncertain access to affordable and nutritious foods. 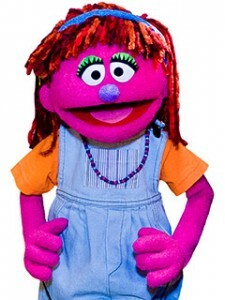 Lily was designed for this special, and there are not currently any plans for her to become a more permanent member of the Sesame Street cast.